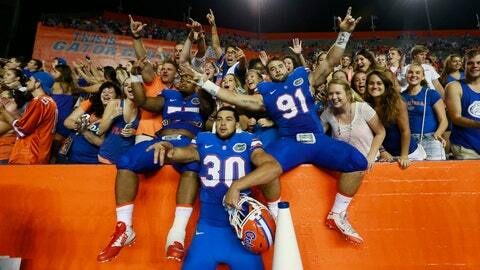 Florida Gators defensive lineman Joey Ivie (91), Florida Gators offensive lineman Andrew Mike (77) and teammates celebrate after their win over New Mexico State on Saturday. GAINESVILLE, Fla. — They scored 61 points. They had 606 yards of total offense. Quarterbacks Treon Harris and Will Grier, one a sophomore and the other a redshirt freshman playing in his first game, looked more like the Manning brothers in a quarterback duel than a couple of college underclassmen. The defense limited New Mexico State to 200 yards and eight first downs. Vernon Hargreaves III made a highlight-worthy interception. Florida committed only one penalty, and it didn’t come until the final five minutes. Fourteen different receivers — yep, you read that right — caught a pass. Toss it all into a mixer and New Mexico State was made into mush Saturday night in the debut of first-year Gators head coach Jim McElwain. The Gators scored more points than they had ever piled up in the first game under a new head coach, cruising to a 61-13 demolition of the Aggies. McElwain was able to take off his headset late in the game and stroll up and down the sideline while his assistants continued to relay information over their headphones. On the outside, he looked like a coach at work. On the inside, McElwain approved of what transpired for 60 minutes on a warm and muggy September night at The Swamp. "That was a great, great crowd and a great opener,” he said. "We played the game fast and physical, and we played it clean." Florida fans certainly approved, rising to their feet for each of Florida’s eight touchdowns on the way to the program’s 26th consecutive season-opening victory. The mood afterward, at least among the fans, was one of Gator giddiness. McElwain delivered. The offense delivered. The Gators delivered. Quarterbacks Treon Harris and Will Grier each turned in stellar performances as the Gators romped over New Mexico State. The announced crowd of more than 90,000 got exactly what it craved. 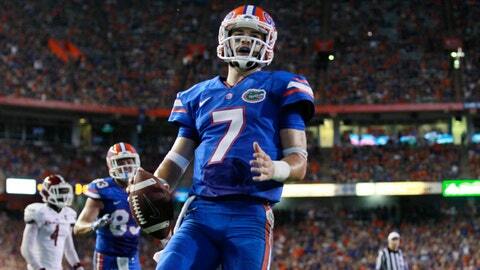 The optimism of the offseason seemed to gain speed each time another Gator found the end zone. When asked about Florida’s 606 yards of offense, McElwain hesitated, and then offered: "It was that much, huh?" To those most passionate about the Gators, there seemed a sense on social media and even among some of the media that Florida had not had an offensive performance like Saturday since No. 15 was the quarterback. In fact, it had been only 11 games. Remember last year’s season opener against Eastern Michigan? The Gators won 65-0 and racked up 655 yards of offense in the debut of offensive coordinator Kurt Roper. But the mood afterward was night and day compared to Saturday. After three years of offensive woes under former head coach Will Muschamp, fans enjoyed a rare breakout, but too many doubts lingered. Those reservations proved to be legit, as Florida snuck by Kentucky in overtime the following week, lost at Alabama, and then had to rely on Harris to bail them out in an ugly win at Tennessee. The season went south after that and a year later, former starting quarterback Jeff Driskel is at Louisiana Tech, Roper is in Cleveland and Muschamp is Auburn’s defensive coordinator. Is McElwain the savior Gator Nation so much wants him to be? Nobody knows yet. But whether you are a Sunday morning quarterback knowledgeable about X’s and O’s, or a grandmother in Tampa who just wants to be entertained on Saturdays, the Gators looked different in their first game under McElwain. They were efficient and in rhythm on offense, the defense was physical and made plays, and they played with a kind of discipline that McElwain has preached since his first day on the job. "That’s what Coach Mac instills in us,” linebacker Alex Anzalone said. "Being disciplined players." Other than for a blocked extra point and what McElwain described as some lazy kickoff coverage, there was little to be critical of as the Gators scored at will and committed just one penalty in a game for the first time since McElwain was in high school (Dec. 3, 1977 against Florida State). The biggest issue McElwain and his staff face this week is what to do at quarterback. Harris finished 14 of 19 for 215 yards and two touchdowns; Grier was 15 of 17 for 164 yards and two touchdowns. They also contributed 66 yards rushing (Grier, 43; Harris, 23). "We’ll probably do something similar next week,” McElwain said. "I can see us do that. Both guys are doing a great job. Glad we have both of them." Receiver Alvin Bailey has no problem with that plan. "Both of those guys add their own little juice to the game, add their own little flavor,” Bailey said. "Playing with both of those guys, plays are going to be made." The exhilaration from Saturday’s performance will have already faded for McElwain by the time he wakes Sunday and comes to the office to meet with his staff. The fans’ excitement won’t fade nearly as fast. Not with what they saw unfold in the season opener. Doubts of the recent past turned into hope. A win as crisp as Saturday’s will do that.